Tucked away in a natural port, Mystic has long been home to seagoing adventure. 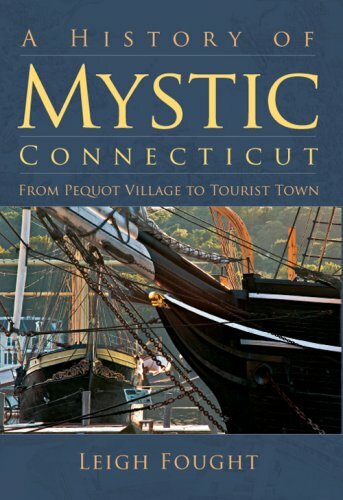 In A History of Mystic, Connecticut, author and former Mystic Seaport librarian Leigh Fought relates the compelling story of this picturesque coastal community. Forged from the brutal Pequot War, for years Mystic was a quiet little farming village. Then came the War of 1812. Mystic's upstart venture capitalists seized on the war's dislocations to transform the settlement into a shipbuilding powerhouse. The shipyards launched vessels by the hundreds and an industry was born. The Civil War, steam-powered ships and the decline of commercial whaling halted Mystic's shipbuilding boom. Yet the town recovered, transforming itself into the charming nautical-themed tourist destination that has enchanted millions. Read Fought's comprehensive narrative to discover Mystic's role in New England's thrilling maritime saga. Leigh Fought, who holds a Ph.D., Master s, and Bachelor s degree from the University of Houston, as well as a Master s in Library Science from Simmons, has spent years immersed in historical research at various archives, institutions, and organizations. She has worked extensively with information technologies, overseen the care and preservation of historical documents at archives nationwide, and taught as well. A specialist in the field of Frederick Douglass studies, Fought currently resides in eastern Connecticut, where she works at Mystic Seaport s G.W. Blunt White Library.